We already discussed recently the biography of Periyāḻvār – or Āḻvār ‘the Great’ – at length – on a separate page, as also Periyāḻvār’s most popular work - Tiruppallāṇdu – which can roughly be translated as “Be forever our Lord!” – however – it was only the first chapter of a much larger work called Periyāḻvār Tirumoḷi or the Holy Verses of Āḻvār the Great. Here you can read it in full, the work Periyāḻvār Tirumoḷi, consisting of 473 verses and 43 smaller divisions according to subjects, as translated into English from the Tamil original. I hope this would help those who are not able to read and understand Tamil. and most part of the poem is dedicated to stories from life of toddler Krishna, the love of His mother Yaśodā and later of Gopīs, the small cowherdesses to Him, Krishna’s victory over demons and so on. There are also shorter fragments from Periyāḻvār’s stories about several other Divine incarnations – as Rāma and as a dwarf Brahmin Vāmana. But the foremost message of the work, often repeated – is to chant Om Namo Nārāyaṇa mantra. Also there is an advise to name children in God’s names, not those of worldly people. And many other interesting things in between. P.S. Indeed, if you know very little about Periyāḻvār, I recommend you to acquaint yourselves with the Biography of Periyāḻvār; it’s a very interesting story. He was also the foster-father of another famous female Āḻvār - Aṇḍāḷ. You conquered your enemies with your strong arms. You have the colour of the blue sapphire. and for many crores of years. Protect us as we are beneath your divine feet. Let us live never apart from your devotees and you. who lives on the right side of your strong chest. that you carry in your right hand. that you blow on the battlefield. come and carry sand and fragrance in his festivals. we will not include you among our devotees. that have not sinned for seven generations. the Rākṣasas and their land Lanka. Let us praise the god and say, “Pallāṇḍu! Pallāṇḍu!”. Come and join us to do service to the god. there is nothing you need to think of to go to him. in all towns and in all countries. O devotees, come and praise the god with us. He destroyed the Rākṣasas and their large clan. and recite the thousand names of the god. they all worshipped him and served him. with the famous divine discus that shines like fire. We join the temple and serve the god for many generations. making all his thousand arms bleed. Let us praise the god and say, “Pallāṇḍu Pallāṇḍu!". earrings to decorate my ears, and sandal paste to smear on my body. so that I would become pure and wise and serve you. We wear the silk clothes that you have worn. We put on the Tulasī garland that adorned you. We eat the food that is left over after you have eaten. We do the services that you want us to do everywhere. and we will do the same in all our lives and in future generations. Release us from birth and give us moksha. You were born on auspicious Śravaṇa day. and danced on Kālinga the five-headed snake. where there is no injustice. You are pure in all ways. 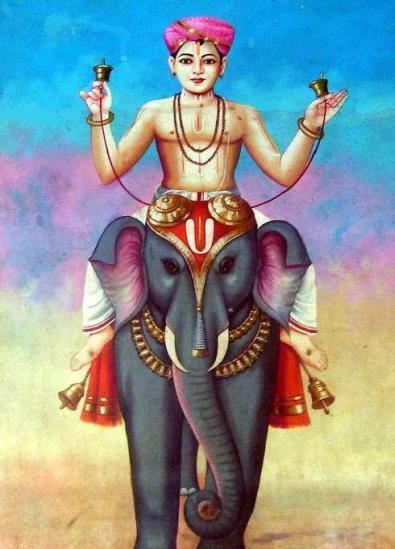 the pure god who carries the bow Śārṅga. they made the front yards of the houses muddy. they ran, fell and shouted in joy. and joy spread everywhere in their village. “See! Among all men there is no equal to this child. rolled them in front of their houses and danced. and their thick soft hair became loose. and laughed with their jasmine flower-like teeth. and jumped into the water to bathe. from the pot and bathed him. and she saw all the seven worlds inside. “This is no cowherd child. He is the supreme god. who lifted up the huge Govardhana mountain. They carried him in their arms and rejoiced. he will kick and tear the cloth of the cradle. If I take him in my hands, he will hurt my waist. If I embrace him tightly, he will kick my stomach. I don’t have strength anymore to deal with him. in Thirukkoṭṭiyur, surrounded with flourishing paddy fields. who recite these poems will go away. 3. Yaśodā and other cowherd women describe Kaṇṇaṉ from his feet to his head. that came from the milky ocean. He puts his lotus foot in his mouth and tastes it. See, you have mouths red as coral. Come and see his lotus feet. with pearls, jewels, diamonds and pure gold. come and see his perfect toes. Come and see his toes. embracing her and sleeps peacefully. come and see his ankles. that Yaśodā had filled doing hard work. and crawled away from her in fear. come and see his knees. demon Pūthanā and killing her. He split the chest of the heroic Hiraṇya. O girls with round breasts! Come and see his thighs! Come and see him. the lord of many elephants that drip ichor. Come, see the mutham of our dear child. and took its ivory tusks and ran away. see his waist, come and see! who is as strong as a white-tusked elephant. come and see his navel! whose colour is as dark as the roaring ocean. and tied him up with an old rope without worrying about him. come and see his stomach! when I, Yaśodā tied him to the mortar. come and see his chest! who came in the form of a cart. when he was only four or five months old. O girls, you have curly hair, come and see his shoulders. that is smeared with oil. and she is raising Kaṇṇaṉ, the beautiful child. come and see his hands. who is being raised by Yaśodā. See his neck that swallowed all the worlds and the sky. O beautiful girls, see his neck. O girls, you are decorated with lovely ornaments! Come and see his mouth red as a thoṇḍai fruit. with turmeric powder and then bathes him. Come and see his eyes, mouth, teeth and nose. who was born on earth as the son of Vāsudeva. and remove the suffering of the gods in the heavens. come and see his eyes. Come and see. and came to save the world. He was born to Devakī, beautiful as Lakshmi. even though she was too young to give birth. come and see his eyebrows. Come and see. the earth, hills, oceans and all the seven worlds. see his lovely emerald earrings. O girls, you are decorated with precious jewels. Come and see his forehead. as the lovely sound of his anklets spreads everywhere. O girls who have round breasts, come and see his curly hair. described the beauty of her child from his feet to his head. composed poems with Yaśodā’s words. will go to Vaikuṇṭha and remain there. 4. Yaśodā sings a lullaby to Kaṇṇaṉ. studded with rubies and diamonds and sent it to you with love. You went to Mahābali in the form of a dwarf. Thalelo, you measured the world, thalelo. with pomegranate flowers for a waistband. You are the god who holds all lives within you. you measured the world for Mahābali, thalelo. the goddess Lakshmi stays on your beautiful chest. gave it to you and stood nearby, thalelo. Your eyes are as beautiful as lotuses, thalelo. Your body is dark as a cloud. a sacred thread for your chest and a waistband. for your beautiful chest where Lakshmi stays. Thalelo, your body is as beautiful as a blue sapphire, thalelo. would be suitable for you and sent them to you. You are decorated with a shining crown, thalelo! You have handsome arms, thalelo. to tie around your forehead. you sleep on Ādiśeṣa in Kuḍandai, thalelo.